Adapted from Decoded, Meltzer’s hit show on the HISTORY network, History Decoded explores fascinating, unexplained questions. Is Fort Knox empty? Why was Hitler so intent on capturing the Roman ‘Spear of Destiny’? What’s the government hiding in Area 51? Where did the Confederacy’s $19 million in gold and silver go at the end of the Civil War? And did Lee Harvey Oswald really act alone? Meltzer sifts through the evidence; weighs competing theories; separates what we know to be true with what’s still—and perhaps forever—unproved or unprovable; and in the end, decodes the mystery, arriving at the most likely solution. Along the way we meet Freemasons, Rosicrucians, Nazi propagandists, and the real DB Cooper. Actor, screenwriter and audiobook narrator, SCOTT BRICK definitely gives new meaning to a hyphenate career with credits in film, television, stage and radio. He studied both acting and writing at UCLA, spent ten years with a traveling Shakespearean company, and then went on to become a freelance writer. In 2000, Brick ventured into narrating audiobooks and quickly found himself embraced by the audio world. He’s won numerous Earphones Awards for his narrating skills, as well as Audie Awards. AudioFile Magazine named Brick “one of the fastest-rising stars in the audiobook galaxy,” and proclaimed him a Golden Voice. 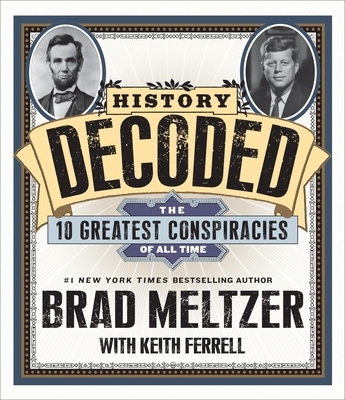 Brad Meltzer is the host of Brad Meltzer’s Decoded on the HISTORY network. He is also the #1 New York Times bestselling author of The Inner Circle, The Book of Fate, and eight other bestselling novels including his newest, The Fifth Assassin. He is the author of the nonfiction bestsellers Heroes for My Son and Heroes for My Daughter as well. He and his wife live in Florida.